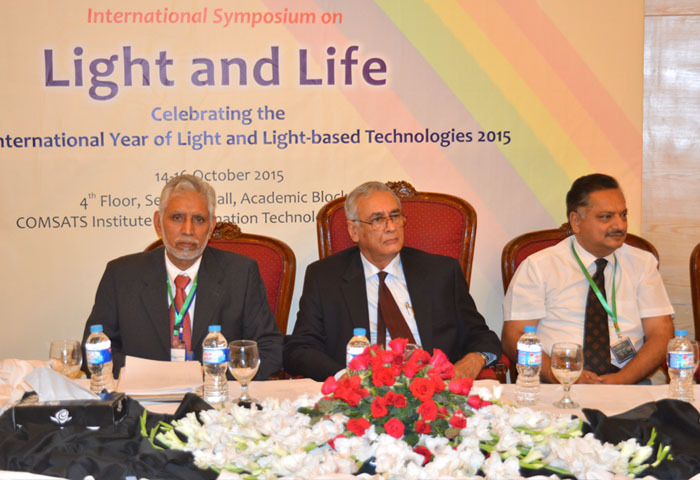 COMSATS’ three-day International Symposium on ‘Light and Life’ successfully concluded on October 16, 2015. 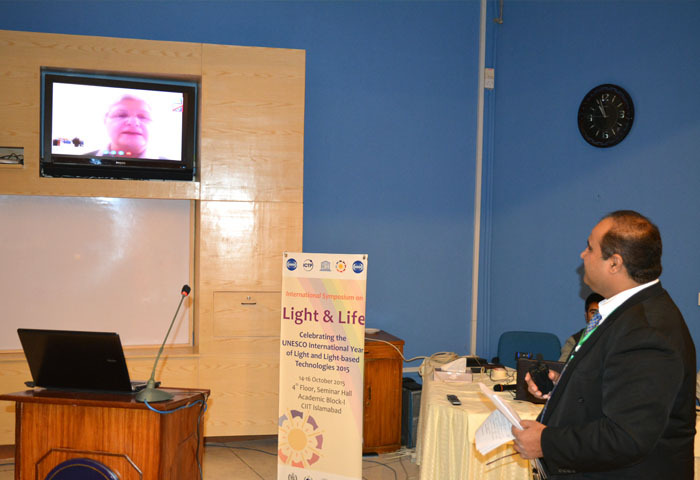 The event was organized in celebration of the United Nations International Year of Light andLight-based Technologies, as well as to highlight the latest research and developments in the field taking place across the globe. Organized in collaboration with COMSATS Institute of Information Technology (CIIT) the event had been inaugurated by the Federal Minister for Science and Technology, and Defense Production, Government of Pakistan, H.E. Mr. Rana Tanveer Hussain, during a ceremony attended by over 150 researchers, scientists, students, and officials from relevant organizations in COMSATS’ Member Countries. 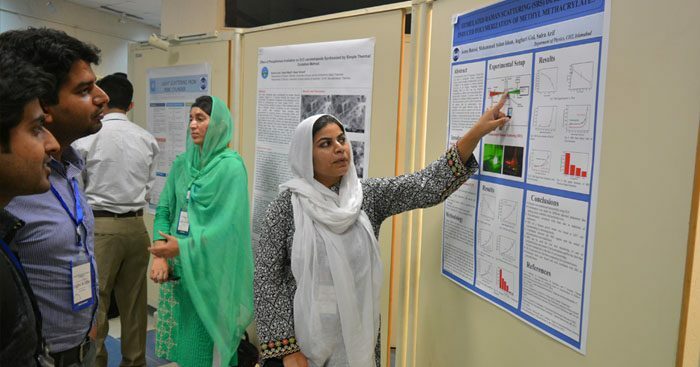 The Abdus Salam-International Centre for Theoretical Physics (ICTP), Italy; CIIT; the Ministry of Science and Technology, Government of Pakistan; the Higher Education Commission (HEC) of Pakistan; and Pakistan Academy of Sciences (PAS), were among the other sponsors of the event. Other speakers of the inaugural ceremony included: the Rector CIIT, Dr. S.M. Junaid Zaidi; Prof. Dr. M. Aslam Khan, Advisor (Physics) CIIT and the Chairman of the event’s Organizing Committee; Prof. Dr. Aslam Baig, Distinguished National Professor at the National Centre for Physics (NCP), Pakistan, and Dr. I. E. Qureshi, Executive Director COMSATS. The technical proceedings of the Symposium that commenced after the inauguration comprised of 16 technical sessions, 9 plenary talks, 14 invited talks, 26 contributed talks, and 17 poster presentations. The topics covered during the event fell in the following broad categories: Light Detection & Harvesting; Light Emitting Devices; Light-Matter Interactions; Light-based Technologies; Photochemistry & Photobiology; Optoelectronics & Photonics; Imaging Science; and Quantum Informatics. 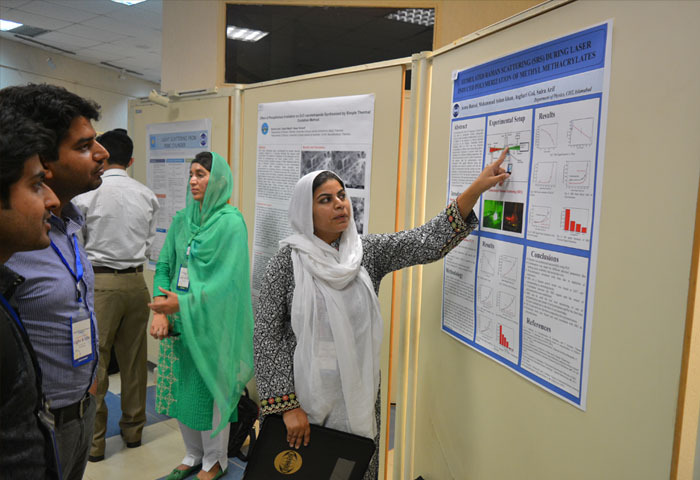 A total of 49 talks were presented on relevant topics by speakers from Bangladesh, China, Germany, Iran, Ireland, Italy, Japan, Pakistan, Sudan, Turkey, UK, and USA. The distinguished speakers included: Prof. Dr. M. Yasin Akhtar Raja of University of North Carolina, USA; Dr. M. Khizar Bhutta of Whirlpool Corporation, USA; Dr. M. Iqbal Chaudhry of Qorvo Inc., North Carolina, USA; Dr. Zahid Yaqoob of Massachusetts Institute of Technology, Cambridge, USA; Dr. Zahid Hussain of Lawrence Berkeley National Laboratory, USA; Prof. Dr. Hani Elsayed-Ali of Old Dominion University, USA; Prof. Dr. Gregory John Tallents of University of York, United Kingdom; Prof. Dr. Soon Xin Ng of University of Southampton, United Kingdom; Prof. Dr. Wolfgang Sandner of ELI-DC International Association AISB, The Extreme Light Infrastructure and DESY, Zeuthen, Germany; Prof. Dr. Maria Allegrini of Universita’ di Pisa, Italy; Prof. Dr. Nabeel Riza of University College Cork, Ireland; Prof. Dr. Hakan Altan Department of Physics, Middle East Technical University, Turkey; Prof. Dr. Gouqin Ge of Huazhong University of Science and Technology, China; and Dr. Shahbaz Anwar of Kyoto University, Japan. Over 175 registered participants of the event benefitted from the expertise and experiences of these and other speakers of the event. Technical deliberations of the Symposium highlighted the great potential o f light and light-based technologies for benefitting the societies at large. Special emphasis was on Solar Energy Harvesting, LEDs, OLEDs, Lasers, Imaging Science even below the diffraction limit with applications in Bio-Sciences and Biotechnology, Environmental Monitoring, Nano Science particularly Nanoscopy, Photonic Devices, Accelerator-based Light Sources including Synchrotron and Free Electron Lasers, and Extreme Ultraviolet & X-Ray Lasers, as well as Quantum Information Processing. The scientists showed how changing the material properties on the atomic scale can help in having more control over the materials response for desirable use, such as efficient conversion of light and maneuverability over the conventional laws of light dispersion, refraction, scattering, etc. Such controls could help minimize losses in the light-based technologies. Considerable emphasis was laid on the solid state lighting (SSL). The scientists highlighted the potential of SSL to become competitive with conventional light sources in the future that could greatly increase their share in the general illumination manufacturing industry and relevant markets. The programme also included a Pre-symposium Workshop on ‘Technology of Light Emitting Diodes’. The said workshop covered three sessions on Technology of Light Emitting Diodes (2), and Organic Light Emitting Diodes (1), during which two experts from Whirlpool Corporations (USA) and CIIT (Pakistan) imparted training. 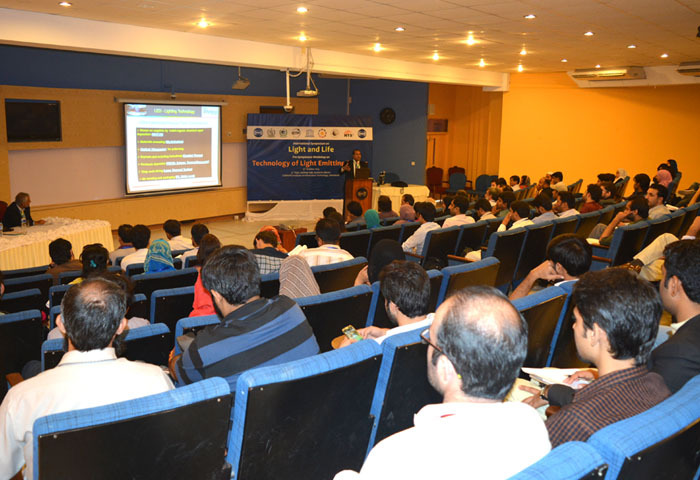 The workshop was attended by over 100 faculty members and students of relevant fields. The Chief Guest of the Concluding Ceremony, Dr. Shaukat Hameed Khan, Coordinator General COMSTECH, formally closed the event with an exciting presentation on the theme of the event giving its historic background and Pakistan’s profile related to light-based technologies. Dr. Shaukat informed the participants of the ceremony about the planned OIC Exchange Programme, to be named ‘Al Haytham Programme’, honoring the eminent Muslim scientist, Ibn Al Haytham. Earlier, Dr. Aslam Khan, Chairman of the Symposium’s Organizing Committ ee, presented the Symposium report, in which he shared the key statistics with a technical overview of the event. He noted the international character of the event and thankfully acknowledged all the local and international speakers for sharing their latest research findings. 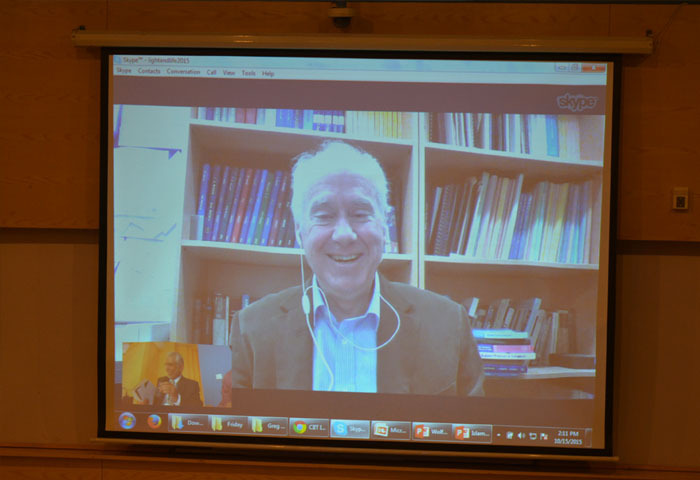 Speaking on the occasion, Dr. Arshad Saleem Bhatti, Dean Faculty of Science, CIIT, suggested that the learning made during the event should be consolidated and an ‘Optical Society of Pakistan’, like the one in the USA, may be created for furthering the spirit of the International Year of Light and Light-based Technologies. Dr. Khizar Bhutta considered the event to be well-planned and well-executed. He considered collaboration between seasoned and young faculty members for greater intellectual output of the universities. 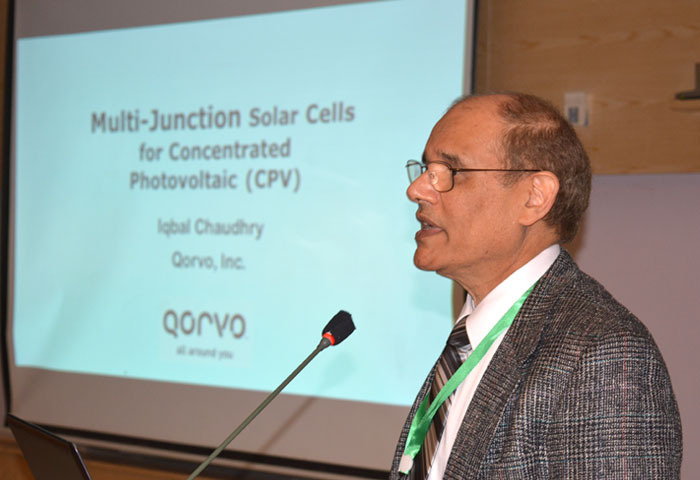 Dr. Sabieh Anwar of LUMS School of Science & Engineering, Lahore, remarked on the importance of the Symposium’s theme and appreciated its scholarly benefits to the students and participants. Dr. Raheel Qamar, In-charge CIIT Islamabad Campus and Dean of Research, Innovation and Commercialization, informed the audience that during 2015, CIIT has so far published over 850 papers in Impact Factor Journals and is projected to become the first university of Pakistan to have published 1,000 such publications in a year. A significant outcome of the event was that the speakers from USA, UK, Germany, Italy and Turkey offered research collaborations and opportunities for graduate studies at their respective institutes to the particispants and other eligible Pakistanis. The event concluded with distribution of shields and certificates to the distinguished guests, speakers, participants and organizers of the event.